Before I went for vacation in May, we visited my cousin sister's place in Boston. She has a 7 seven years old son and almost 3 years old daughter. Usually I get some toys or make some toys to gift them while I visit them .This time I called my sister to ask what are their current favorite cartoons so that I can buy toys of their favorite characters. It was "Dora" for my niece. We went to "Toys'R'us" to get toys but surprisingly there were only two or three items out of which one was a "Dora doll" and others were small place things which is for age group of 3+. So ,we got a doll along with another toy but I was not very satisfied. We had the trip planned for weekend and we visited the shop on thursday before that weekend.Suddenly on friday afternoon when I was packing for the trip, I thought I could make her a small dora bag if I had enough dora print fabric. I started digging through my fabric collection and found I had bits and pieces of Dora print fabric from DIY No sew shape pillows. My plan was to make a small bag and I did not had enough time to look for inspiration or find a tutorial.So , I made a small square of 5"X 5" and developed my own pattern.If you get to this situation in future ,remember this bag tutorial and I will show you how to make. Step 2: Use the pattern and cut the fabric pieces with 0.25" seam allowance. 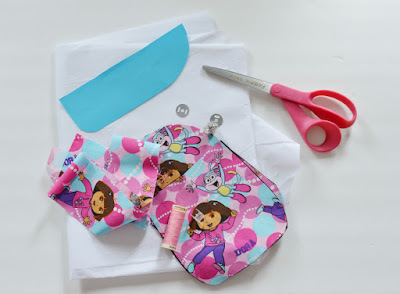 Two fabric pieces for back with flap part(One with Dora print and one lining piece) .Fold the flap or cut the pattern and trace the remaining for front piece.Cut two pieces for front(One with Dora print and one lining piece). 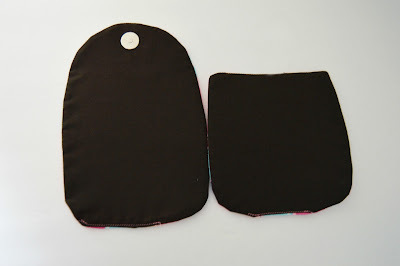 Also cut the interfacing for both the front and the back. 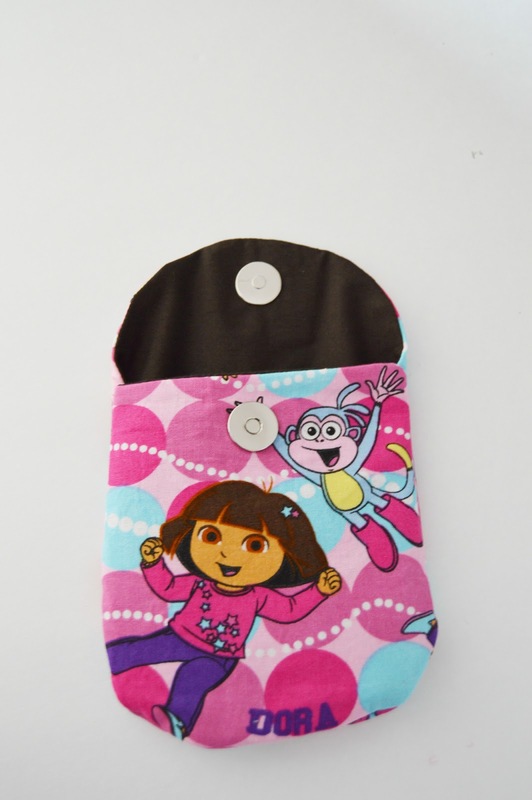 Cut 2" X 25" for handle from "Dora" print if you have or use the lining fabric color. 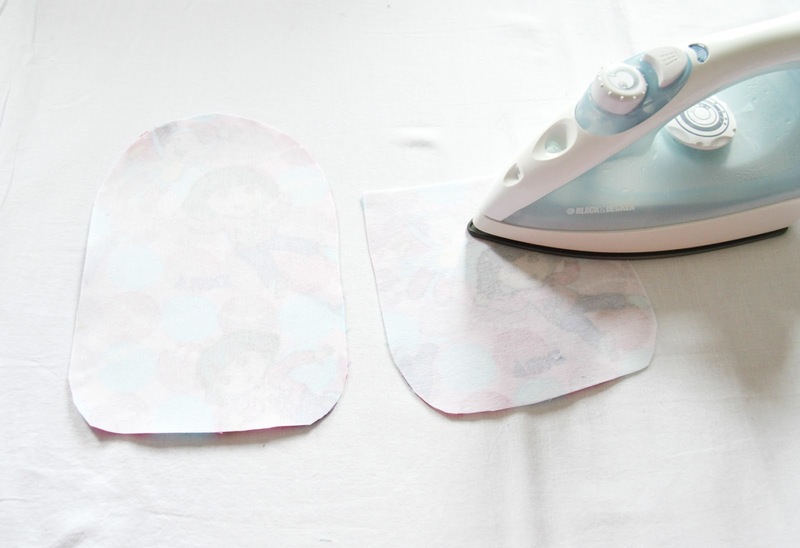 Step 3: Iron the interfacing of front and back piece on to the Dora print fabric. 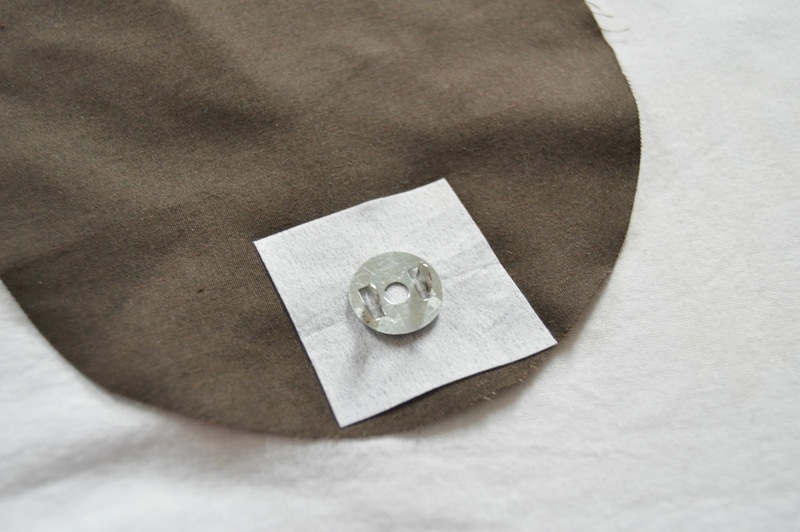 Take a small square piece of interfacing and iron it on to the back side of flap to attach the magnetic button. 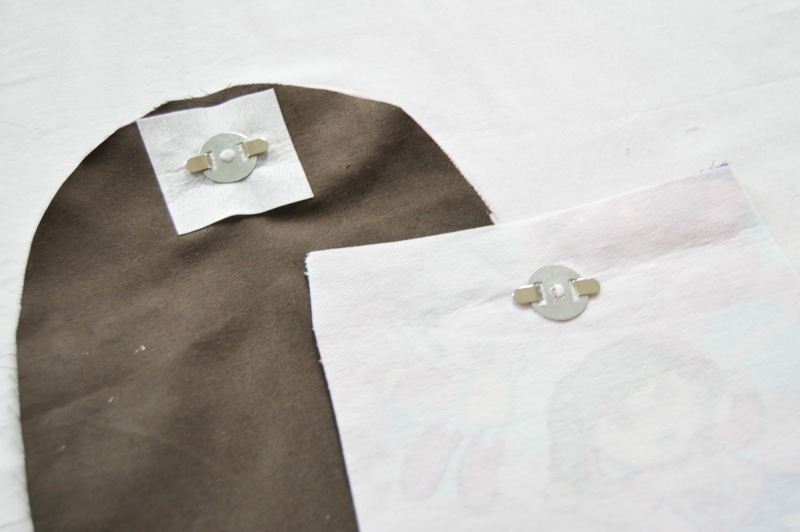 Make two small slit in the area of interfacing to attach the buttons.Use the button to mark the distance between the two slits. Insert the button into the slit and put the metal piece .Use the edge of the scissors to secure the metal part of the button as shown. Repeat the same procedure for attaching the another part of the button to the front piece of the bag. Step 4: With right sides of the back pieces facing each other, sew along the edge with 1/8" of seam allowance leaving small gap. Use the gap to turn the fabric inside out ,iron the piece and sew the gap. Repeat the same procedure for the front pieces. (Usually the flap of the back piece and the front hem is alone sewn and turned inside out but I felt to sew the whole piece as kids are handling the bag .I don't want fraying edges inside the bag.But it is up to you :)). Step 5: Now with right sides of front and back pieces facing each other ,sew along the edge with 1/8" seam allowance and turn inside out.Iron the purse.Yes!! I said purse as we did not attach the handle yet. If you want to leave it at this point , then you will have a mini Dora purse :). Still a few more steps to the bag. 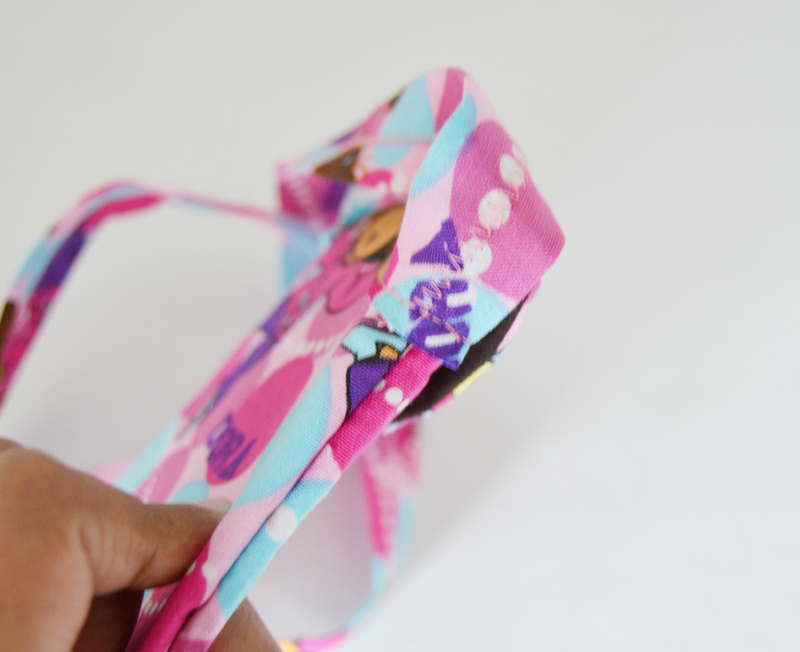 Step 6: Fold 2"X 25" fabric into half lengthwise and sew along the edge with 1/4" seam allowance. 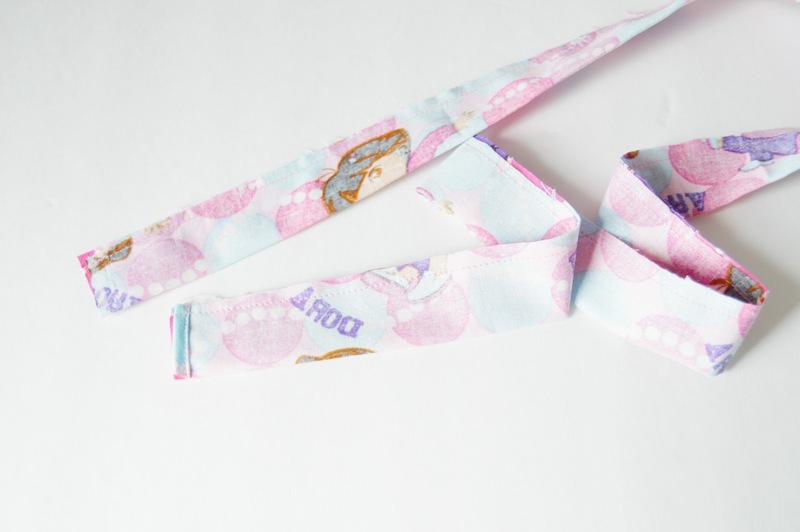 Before this ,if the edges of the fabric handle piece is fraying , fold and sew. Turn the handle piece inside out and iron with the seam in the middle. Add a zig zag stitch in the middle for decoration. 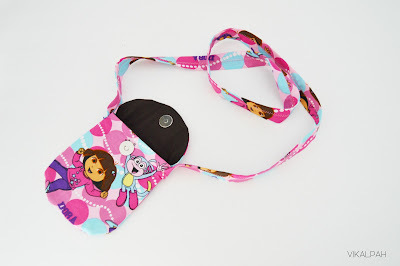 Hand sew the handle with back stitch to the purse.Voila !! 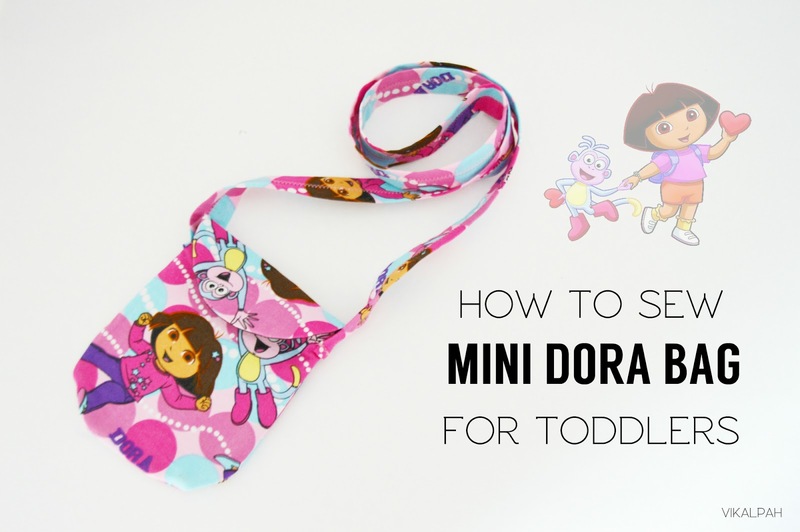 Your mini Dora bag is ready for the exploration!!! My niece was very happy with the bag that she even slept with it on her that night. She did not wanted to remove and also give her bag to anyone. My sister was saying it was tough for her to make her forget the bag.I was so happy to hear that from her. This is why I always prefer handmade gifts to store bought ones.What do you say ?? 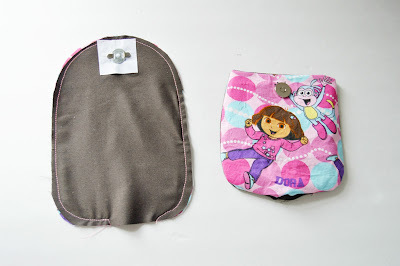 I hope you enjoyed the making of the mini bag and I am sure it will help you someday. 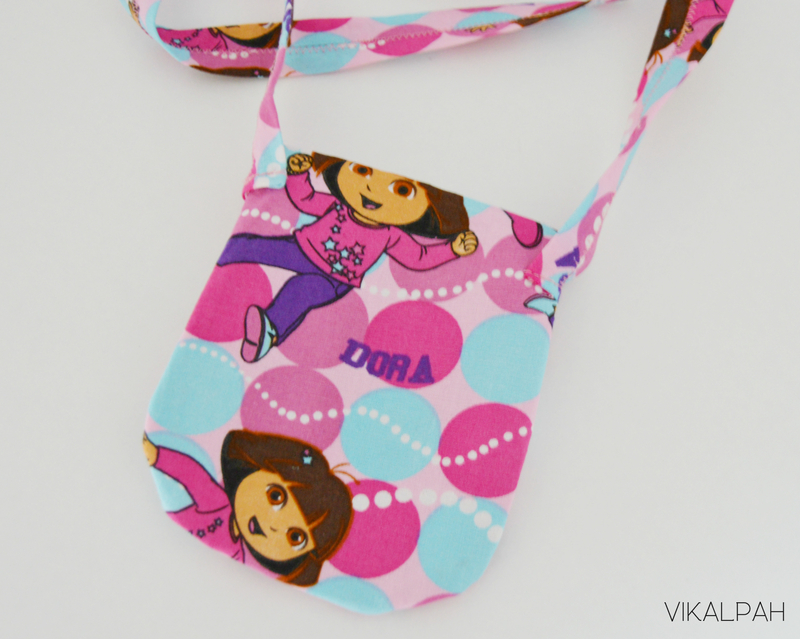 Don't worry if you don't have a sewing machine, you can hand sew this bag or use fabric glue to make this. Let me know what you think in the comments below. As always I will be happy to hear from you. 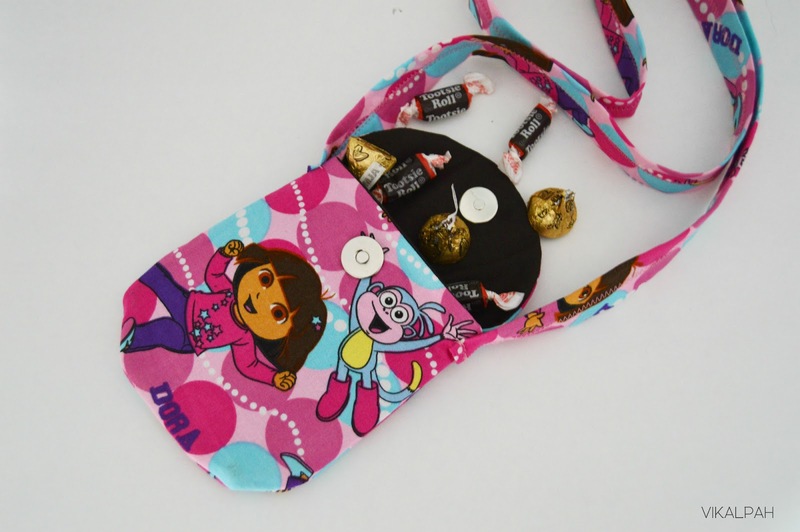 This is such a cute Dora bag! 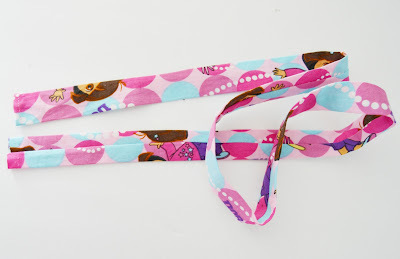 I would love for you to link up to the Stitch It, Blog It, Share It Link Party going on now at BehindtheSeamsSewing.com. Such cute bag, no wonder your little niece was so thrilled with it. thanks for the clear photos on how to install the magnetic clasp, I am yet to have a go at them. Oh my gosh! 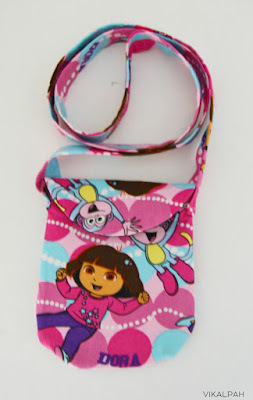 I know some little girls that would LOVE this bag. Super cute. I wish my girls were younger, I would so make these for them. People always said that they looked like a real life Doras. Love having you as a co-host on #HomeMattersParty.